Born 28 September 1972 in Leningrad, USSR. Research interests include bird migration, orientation and navigation, with a focus on navigational map of long-distance migrants and compass systems of migrating birds. Studies physiological mechanisms of magnetoreception in birds. 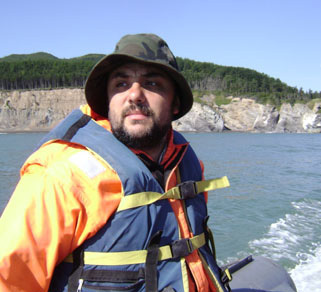 Apart from work at the Biological Station Rybachy, is a full professor at the Department of Vertebrate Zoology, Faculty of Biology, of St. Petersburg State University. Chernetsov N. 2012. Passerine migration: stopovers and flight. Springer Berlin Heidelberg. 184 p.
2014 – present: senior researcher, since 2016 full professor Department of Vertebrate Zoology, Faculty of Biology, St. Petersburg State University. 2005: Post-doc at the Department of Behavioural Ecology, Adam Mickiewicz University in Poznan. 2000–2002: Post-doc at the Max Planck Institute for Ornithology (Vogelwarte Radolfzell), Germany, with Prof. Peter Berthold. 1999 – present: junior research fellow at the Zoological Institute, Russ. Acad. Sci. Research fellow since 2000, senior research fellow since 2004, leading researcher fellow since 2009, director of the Biological Station Rybachy since 2015. 1994–1996: research assistant at the Biological Station Rybachy, Zoological Institute. 2000: Awarded a Ph.D. on 'Migratory strategies of Acrocephalus warblers within Europe' from the Zoological Institute, Russian Academy of Sciences, St. Petersburg. 1994: Master of Science (diploma with honours) in Biology from St. Petersburg State University. Chernetsov N., Pakhomov A., Kobylkov D., Kishkinev D., Holland R.A., Mouritsen H. 2017. Migratory Eurasian reed warblers can use magnetic declination to solve the longitude problem. Current Biology 27 (17): 2647–2651. Pakhomov A., Bojarinova J., Cherbunin R., Chetverikova R., Grigoryev P.S., Kavokin K., Kobylkov D., Lubkovskaja R., Chernetsov N. 2017. Very weak oscillating magnetic field disrupts the magnetic compass of songbird migrants. J. R. Soc. Interface 14: 20170364. Komolkin A.V., Kupriyanov P., Chudin A., Bojarinova J., Kavokin K., Chernetsov N. 2017. Theoretically possible spatial accuracy of geomagnetic maps used by migrating animals. J. R. Soc. Interface 14: 20161002. Ergen A.G., Chernetsov N., Lundberg M., Åkesson S., Bensch S. 2017. The use of molecular diagnostics to infer migration directions of Willow Warblers in the southeast Baltic. Journal of Ornithology 158:737-743. Chernetsov N. 2017. Compass systems. Journal of Comparative Physiology A 203:447-453. Chernetsov N. 2015. Avian compass systems: do all migratory species possess all three? Journal of Avian Biology 46 (4): 342–343. Kishkinev D.A., Chernetsov N.S. 2015. Magnetoreception systems in birds: a review of current research. Biology Bulletin Reviews 5: 46-62. Kishkinev D., Chernetsov N., Heyers D., Mouritsen H. 2013. Migratory reed warblers need intact trigeminal nerves to correct for a 1,000 km eastward displacement. PLoS ONE 8 (6): e65847. Mettler R., Schaefer H.M., Chernetsov N., Fiedler W., Hobson K.A., Ilieva M., Imhof E., Johnsen A., Renner S.C., Rolshausen G. Serrano D., Wesolowski T., Segelbacher T. 2013. Contrasting patterns of genetic differentiation among blackcaps (Sylvia atricapilla) with divergent migratory orientations in Europe. PLoS ONE 8(11): e81365. Chernetsov N. 2011. Daytime movements of nocturnal migrants at stopover between two nearby capture sites. J. Ornithol. 152: 1007-1011. Kishkinev D., Chernetsov N., Mouritsen H. 2010. A double-clock or jetlag mechanism is unlikely to be involved in detection of east-west displacements in a long-distance avian migrant. Auk 127: 773-780. Chernetsov N. 2010. Recent experimental data on the energy costs of avian flight call for a revision of optimal migration theory. Auk 127: 232-234. Chernetsov N., Kishkinev D., Gashkov S., Kosarev V., Bolshakov C.V. 2008. Migratory programme of juvenile pied flycatchers, Ficedula hypoleuca, from Siberia implies a detour around Central Asia. Animal Behaviour 75: 539-545. Mukhin A., Chernetsov N., Kishkinev D. 2008. Acoustic information as a distant cue for habitat recognition by nocturnally migrating passerines during landfall. Behavioral Ecology 19: 716-723. Chernetsov N., Kishkinev D., Mouritsen H. 2008. A long-distance avian migrant compensates for longitudinal displacement during spring migration. Current Biology 18: 188-190.